There is no sizing standard in Australia, which often leaves shoppers frustrated when trying to find the right fit. WE all know when it comes to buying clothes in Australia, one size doesn't fit all. Shopping at your local Westfield, chances are you'll be one size in Country Road, and something completely different when you walk in to Witchery. It's a frustration most women have slowly learnt to accept when forking out for fashion. But it would seem the discrepancy in sizing has reached a whole new level of confusion when shopping at discount retailer Kmart. 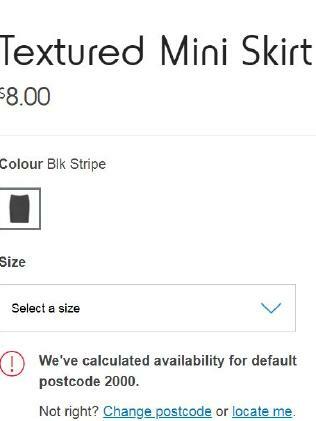 Taking to the Kmart Mums Australia Facebook page, poster Kirra Lee uploaded an image of herself in a Kmart black and white pinstriped miniskirt. 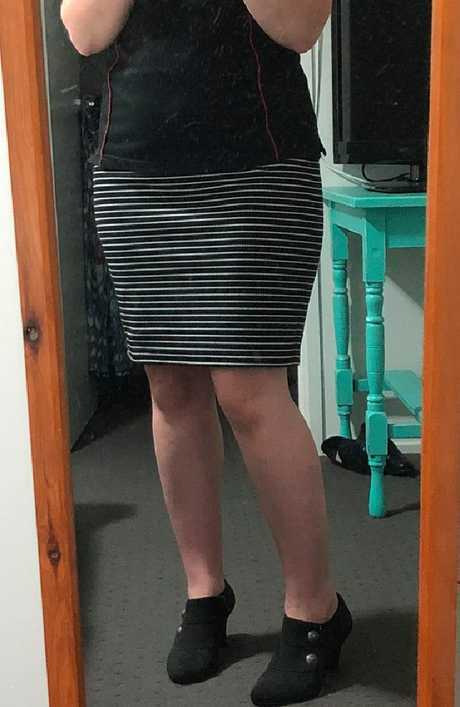 "Bought my first size 18 skirt today. F**k you Kmart for your ridiculous sizing," she wrote of the $8 item. A woman posted to a private Kmart page about their sizing. Her post, which received a number of compliments about the style and fit, also attracted hundreds of posts from other shoppers agreeing the retailer fails to provide accurate clothes sizing. "I know how u (sic) feel I'm a size 12 usually but had to buy size 16 in their pants," one person said. "Crazy sizing". "I'm usually a size 6-8 and bought a size 16 dress in summer!," another added. "I am a size 14 MAX around my waist and legit was in tears because I had to buy a size 18 bikini bottoms," another shopper complained. "I was not a happy camper." Other shoppers said some clothing sizes are double what they'd normally purchase when trying on items from other brands. The skirt retails for $8. "Kmart thinks I'm a size 20+ I AM A FREAKING 10-12! !," one angry shopper posted to the thread. "I tried to buy gym clothes and ended up running out of the store in tears after sitting in the changeroom watching the size go up and up and up. "I usually wear a size 16 the other day I had to buy a top sized 26. 26!! !," another added. "Made me feel awful." 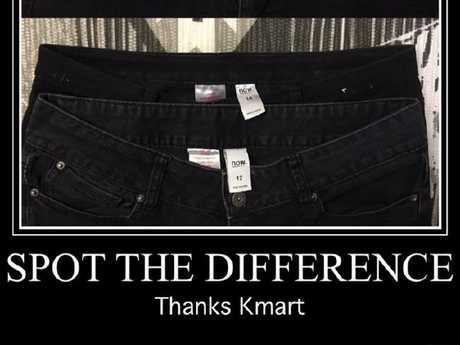 One shopper even posted a meme showing the size difference between two pairs of black Kmart branded jeans, showing the minuscule difference between a size 12 and 14. A side-by-side comparison of Kmart jeans. Unlike the UK and the US, Australia has no sizing standard, which often leaves shoppers confused and annoyed when it comes to finding the perfect fit, especially if they're looking to make a purchase online. The Australian Standard Size Coding Scheme for women's clothing was scrapped in 2008, allowing retailers to develop their own sizing scale based on sales data. A study conducted by the University of South Australia and SHARP Dummies in 2002 found that about half the people surveyed said they couldn't buy "regular"-sized clothing as it didn't fit their body shape, and it seems things haven't improved since. According to Australian Design Alliance CEO Jo-Ann Kellock, the reason why you might be one size in Country Road, two sizes smaller in Sportsgirl and one bigger in Cue, is because each fashion brand creates its own size system around their different target markets. Clothing sizes in Australia can leave even the most tolerant shopper feeling frustrated. 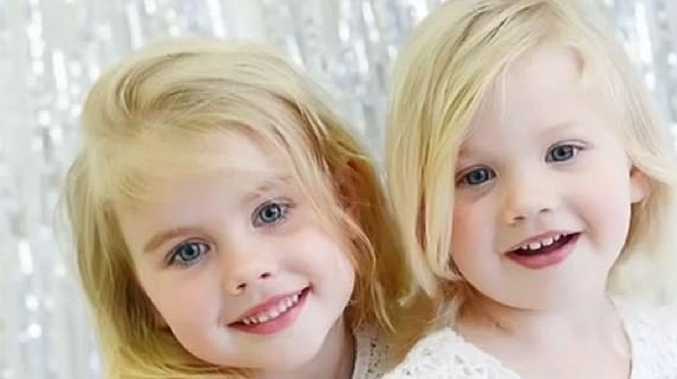 "Brands profile their target markets and determine their size ranges from that," Ms Kellock told news.com.au ahead of the Standards Australia Committee CS-092 Sizing Systems for Clothing meet in Sydney in 2016. "They look at who they want to sell to, the position they want to place themselves in the market and the price point. "Is it a luxury brand, is it what we call 'fashion forward', or 'fashion basic'? Then they'll look at that woman's age, body characteristics, her shape and size, to determine the shape and size of the clothing range. "All of those things come into the mix when brands are profiling their customer." Frustration when trying on clothes is all too common in Australia. According to Choice, the discrepancies between different brands and their sizing can also come down to Australia's growing waistline. Known as vanity sizing, rather than keeping sizes consistent, retailers sensitive to the delicate issues around weight and self-image have simply snuck a few centimetres into their sizing. The rationale is that the customer will feel so good about suddenly fitting into a size 10 they will snap it up immediately. Clearly this isn't a tactic used by Kmart, although it has been used in the past by retailers such as Myer and Country Road. News.com.au has contacted Kmart for comment. 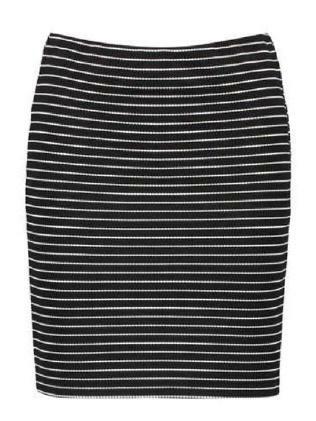 The skirt from Kmart that sparked the debate.